Vacation in the heart of the Aska Adventure Area at Aska Bliss. Aska Bliss is a four bedroom, three bath luxury masterpiece. 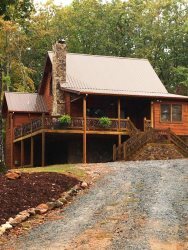 This property will sleep up to 10 people and has all the amenities everyone requests including a lovely mountain view, hot tub, air hockey table, jetted tub, fire pit, wifi, gas grill, screened in porch, and a gas log fireplace to be used during fireplace season. Walk into the kitchen and dining room of Aska Bliss to find upscale furnishings and appliances. Aska Bliss even has a George Foreman grill and blender. The main level bedroom has a queen bed and doors leading to a screened in porch. It also has a shower/tub combo bathroom. The lower level has two bedrooms each with queen beds, a bathroom with a shower/tub combo, and a game room with air hockey and a large flat screen tv. The upper level of the cabin has another bedroom with a queen bed, and a bathroom with a jetted tub and walk in shower. The bedroom also has doors leading to another porch with rocking chairs. This cabin is also conveniently located to some of the areas best bike trails. View maps of the Aska Adventure Area on the Fannin County Chamber of Commerce websites for self guided tours. Pull up a chair and relax while watching the sunset at Aska Bliss. BOOK TODAY! The cabin was just perfect. The fireplace, hot tub, firepit, patio seating, and view. Had the perfect features. Beautiful cabin. We will be back!! A great location, all the necessary amenities, and were incredibly helpful when my friend forgot her glasses. It was a great cabin for the group of 10 of us, and couldn't be more happy with the stay! Mountain Laurel did a great job communicating check in with us. The house was perfect for 4 couples but would have also worked for families. Fire pit was great at night!! We had a fabulous weekend and enjoyed the cabin! We loved staying here! It was the perfect getaway and we can't wait to come back! Plenty of room and was the perfect little mountain getaway. I stay with Mountain Laurel at least 4 times a year. I will be back next month! Very nice cabin; enjoyed the amenities. Spacious interior with wonderful gas fireplace. The rental company was great in communication regarding imminent threats to the area (north Georgia wildfires). The cabin was spacious and very clean. We had a couple minor issues that were addressed and resolved within an almost shockingly timely manner. All in all, I would absolutely stay here again.